Turn the oven to 220 degrees. 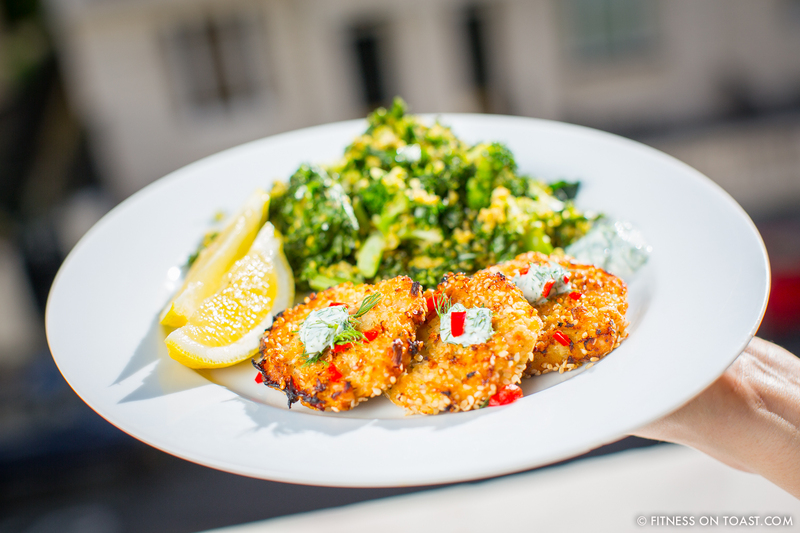 (Alternatively, you can fry the fish cakes in a little coconut oil but my preference is to oven-bake them). Firstly, cut up the white fish into small pieces and place them into a big bowl. Add the salmon, and finely chopped shrimps. Add the chili, salt, pepper, fish fond, finely chopped onion, pepper and garlic, and mix all the ingredients together well. Really work the mixture together. Then add the egg white to the mixture to bind it, and mix that well. Prep a plate of the sesame seeds. Spread them out evenly. Then make evenly sized balls out of the fish mixture, and squash them on the sesame seed plate. Turn over and cover the other side with sesame seeds too. When you have made all the cakes; place them in the oven on baking paper and let cook until golden before flipping the fish cakes and letting the other side golden. Finally, serve straight out of the oven with the kale quinoa salad on the side. If you want an extra treat add a take on the classic white sauce. Leave this to the end or make it early and have it cold – both taste gorgeous. Cut the Kale and place it in the over with some olive oil, pinch of pink salt and pepper. Boil the quinoa, add a pinch of tarragon, salt and pepper to the water. Once boiled mix the quinoa and kale together and set aside. Sprinkle some nuts or seeds or perhaps some pomegranate on top for a little extra crunch. Lovely and it might be dinner! what sort of fish do you use for this Faya? I want to try making the burgers. It’s a nice look My dish. These look heavenly! I can’t seem to click on the link for the full recipe though!